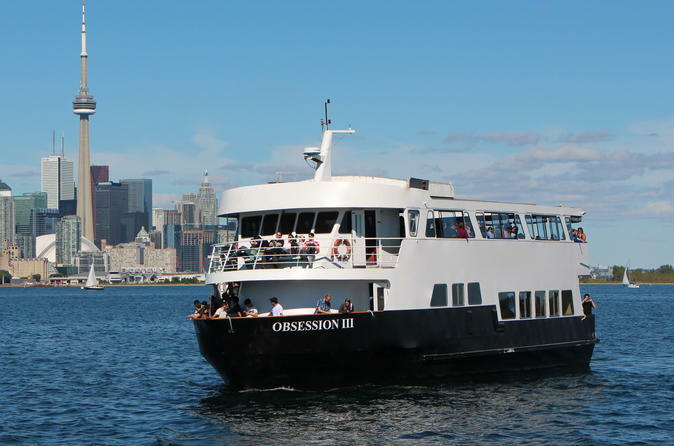 Whether you are a Torontonian or just visiting, an Obsession III brunch cruise is a great activity for the weekend. This is the perfect way to unwind after a hectic week. Cruise includes jazz music, champagne mimosas at boarding, a delicious brunch buffet, and a fully licensed bar and retractable roof on board. Please note: the supplier does not receive the cruise schedule until the end of March. Bookings received before the 1st of April cannot be guaranteed and may be canceled due to the cruise being unavailable. Board your cruise in late morning at Queens Quay and enjoy stunning views of Toronto’s beautiful skyline and Toronto’s vibrant harbor-front. If you’re looking for delicious food and fabulous entertainment, this 2-hour Weekend Brunch Cruise aboard Obsession III is the perfect activity for you. As you cruise you’ll have plenty of time to relax, sample tasty items from the brunch buffet, and see the sights. During your cruise you will view some well-known Toronto attractions, such as the CN Tower and Toronto Islands through large dining area windows and open air look outs. Jazz music will play in the background. Listen to a mixture of soothing sounds to delight your senses as you spend time with your family and friends.